Pixar Pier debuted in Disney California Adventure at the Disneyland Resort on June 23, 2018. This re-theming of the former Paradise Pier has some great new touches and a lot of long lines. We have all the best tips for your visit. A short bit before the grand opening of Pixar Pier, I wrote an article, kind of an opinion piece, sharing why the success or fail of Pixar Pier is important. Then, not even a week after the grand opening of Pixar Pier, I headed down to check it out for myself. 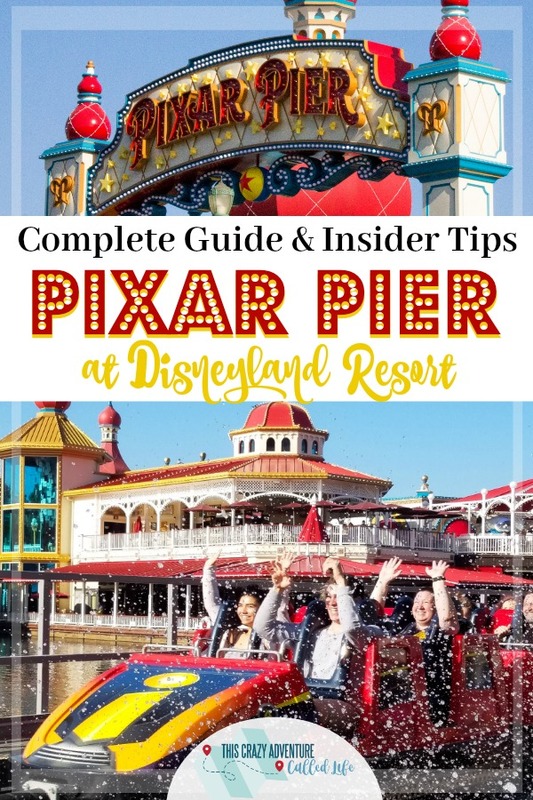 Pixar Pier is a definite success, and I am super excited to be bringing you all the best tips, and everything you need to know about Pixar Pier for your next visit. What Is Open At Pixar Pier? 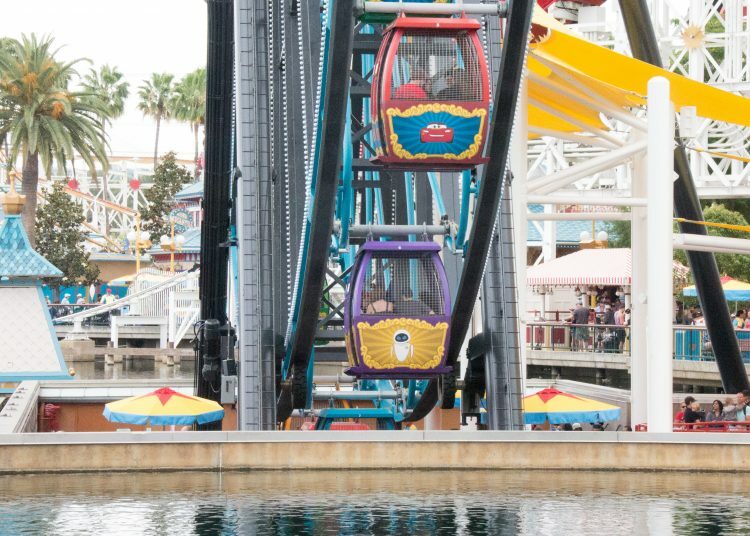 Pixar Pier is a re-imagining of Paradise Pier. One thing that will be shocking to somebody heading to Pixar Pier is that the land is NOT complete. There were still plenty of construction walls to be found and missing elements. I will be updating this post as new rides, shops, and more are added to Pixar Pier, but for now, I will just say the amount of walls still in place made the area seem much more crowded and a little underwhelming. Bing Bong’s Sweet Stuff is blocked off, though you can see the theming. It is behind a long purple (if I remember correctly as I apparently didn’t photograph it) wall. This wall also covers the area where the new Inside Out Emotional Whirlwind ride (rethemed from Flik’s Flyers in the soon to be closing “a bug’s land” will be). There are also walls around the former King Tritan’s Carousel (which is being rethemed as Jessie’s Critter Carousel). These walls are much less noticeable as there is a permanent wall/water feature that is incredibles themed along one side. 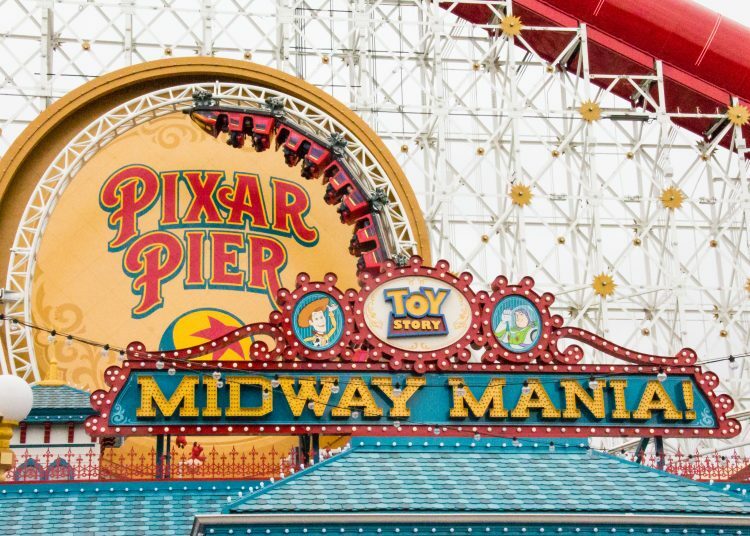 What is open at Pixar Pier is Toy Story Midway Mania, Incredicoaster, Pixar Pal-A-Round (formerly Mickey’s Fun Wheel) and various board walk games, and dining options. The most anticipated part of Pixar Pier would have to be the reimagining of California Screamin’ to the Incredicoaster. But that is not the only ride in Pixar Pier. Here is your complete guide to rides in Pixar Pier. 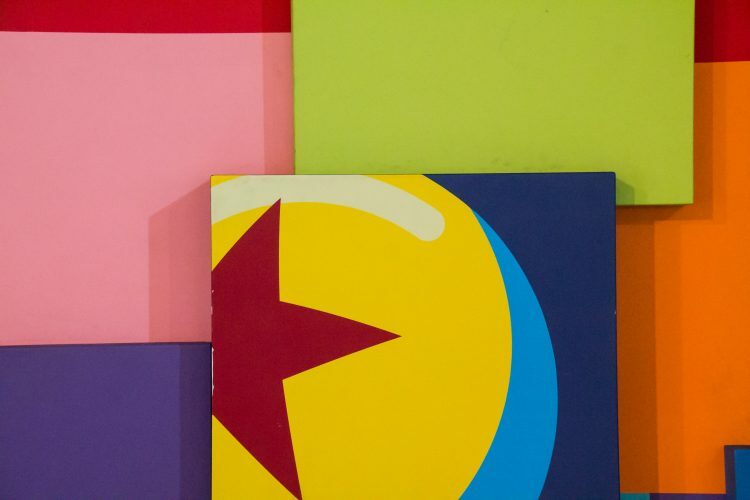 Toy Story Midway Mania is the only ride that did not receive a retheming in Pixar Pier. While the ride is the same, it did undergo some changes. A new sign is just the beginning. The entrance for both standby and Maxpass/Fastpass has moved to the side of the entrance (past the interactive Mr Potato Head). The old entrance area is now used for a meet and greet area. We mostly saw Jessie doing meet and greets in this area. Toy Story Midway Mania tends to have a long wait, often times longer than Incredicoaster. I strongly suggest getting a fastpass for this ride. Even then, we often found the fastpass line was lined up out into the walkway, and when we went to redeem ours, a Cast Member said the fastpass/Maxpass return line was at least 40 minutes long….we cancelled our MaxPass. King Tritan’s Carousel is being reimagined into Jessie’s Critter Carousel. This ride is not open yet, but I will be sure to update this post when it is open. Right now, the ride has walls around it, but they do not interfere with the flow of the pier. This is the retheming of Mickey’s Fun Wheel. Not much has changed for this ride. The entrance has been spiffed up and the wheel got a fresh coat of paint, and some new characters featured on the gondolas. They still have swinging and non-swinging, and I was told there are still barf bags in the swinging ones. I mentioned earlier that there is still a big wall along the area of Pixar Pier across from Pixar Pal-A-Round. This is where the future Inside Out themed neighborhood will be. In this neighborhood, there will be an Inside Out themed ride. When “a bug’s land” closes later this summer, they will retheme Flik’s Flyers and use it here. It is nice to know there will be another toddler friendly ride in this area. This is probably the most anticipated change for Pixar Pier. 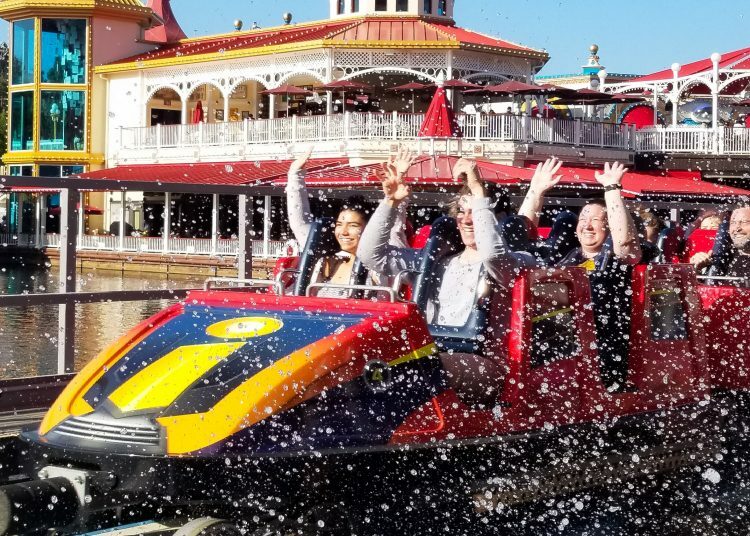 The former California Screamin’ has been rethemed to Incredicoaster. I am a total sceptic when a ride that was already popular is rethemed. 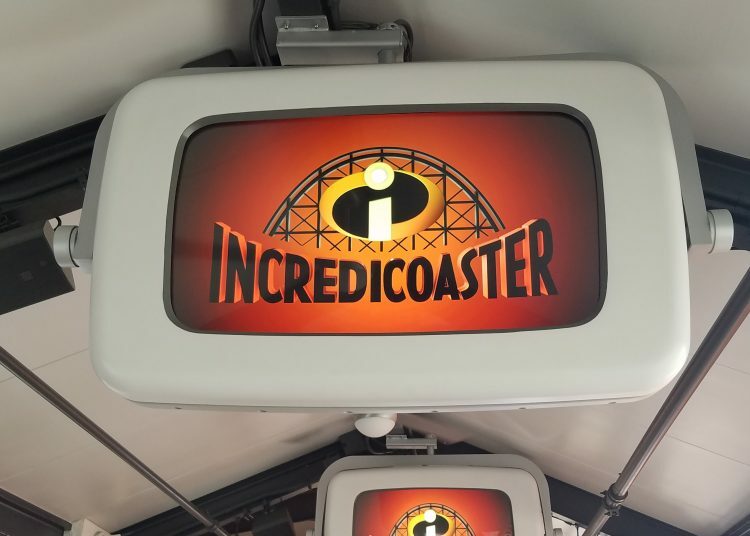 I rode the Incredicoaster three times during the four days I was in the park. My verdict….it is AWESOME! This ride feels so much more “Disney” now. There is an actual theme/story to it. This ride is a bit different than the opening of the retheming of Tower of Terror to Guardians of the Galaxy: Mission Breakout! Let me explain what I mean. While the ride track and cars are the same (and so is the 48 inch height requirement) the theming on this ride is much better and leads you on an adventure all it’s own. The fact that there is more of a story line, and things to follow makes the ride feel faster now too. 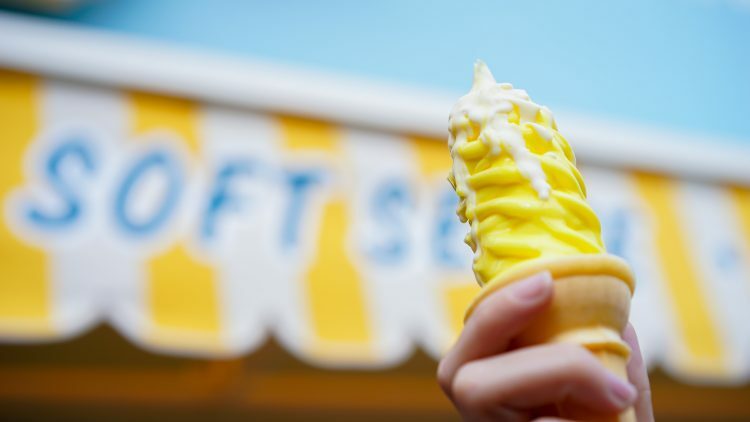 While you are at Pixar Pier, you may want to grab a bite to eat or do some shopping. Piar Pier definitely has a variety of options for you (with more on the way). I personally found the dining options a bit lacking unless you choose to dine at Lamplight Lounge (formerly Ariel’s Grotto and Cove Bar). Don’t get me wrong, they are there, but they are not much more than the food carts you find through out the parks. Here is a break down of the dining options at Pixar Pier. Remember that you can easily view the dining options and their menus on the official Disneyland app. Disclaimer: I am not a foodie. So I do not taste all the foods. This is the only table service (aka sit down and eat) dining option on the pier. The Lamplight Lounge was formerly Ariel’s Grotto and Cove Bar. Since this was a last minute trip, there were no dining reservations, and standby seating was long. The menu can be found on the app or online, and you can expect to spend around $35/adult for a full meal and dessert, if not more. I don’t even remember what this was called before, but it was soft served ice cream. I didn’t get a chance to try out this location, even though I would have like to, because the line was always SO LONG! I imagine as the newness of Pixar Pier fades, the lines will become shorter, but those I talked to in the line had been waiting for about 15 minutes and were about halfway through. 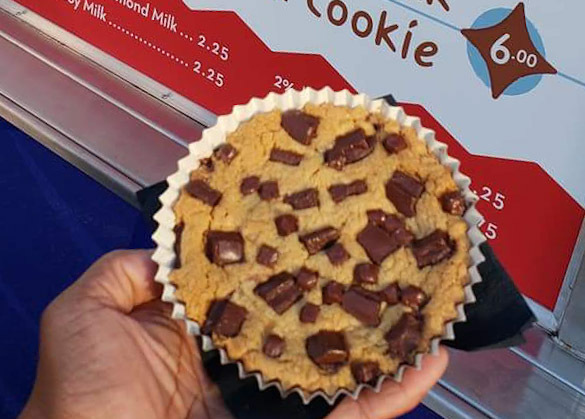 Just near the entrance and exit of the Incredicoaster is the Jack-Jack Cookie Num Nums cart. The cookies here look amazing! They run $6 though (so be prepared) for these restaurant style cookies. Again, I didn’t taste them, but our friends at City Stroller Rentals and Pixie-Magic did. I love that they have a gluten free cookie option. A giant turkey leg is one of the most famous snack options at Disneyland Resort, and you can find it at the Poultry Palace on Pixar Pier. But that is not all you can find. Chicken/poultry lovers can rejoice in having multiple options in one location. My friend got the giant turkey leg, and Pixie Magic checked out the drum stick meal at the Pixar Pier preview event. You can also find corn on the cob and sodas/water or a bag of chips here. Angry Dogs is a hot dog cart with an Inside Out theme. You can order either an “Angry Dog” (spicy) which comes with spicy Cheetos or a “Slightly Annoyed Dog” (regular hot dog) which comes with Lays. 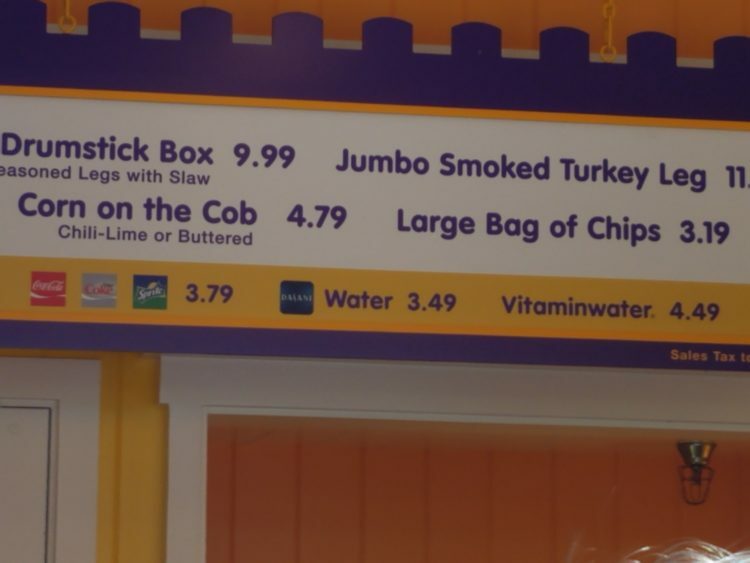 They will not let you mix and match the chips/hot dog combos. (At least not when the people in front of us asked.) My husband likes spicy foods and is excited to try the spicy hot dog when he goes next. Buzz is in Spanish mode again! This time he is selling yummy churros. You can get both (spicy) Caliente Churro and the Cinnamon Super Galaxy Churro. You can also find a popcorn cart in Pixar Pier. There are a couple of cute shops on Pixar Pier, and another one in development. Of course, right now, during Pixar Fest you can find a lot of great Pixar merchandise through out the Disneyland Resort. This cute little shop is located just as you enter Pixar Pier, across from Lamplight Lounge. Here you can find some amazing Pixar themed merchandise, as well as watch Disney Artisits sketch out some of your favorite Pixar characters. There is also a Fuel Rod Kiosk in Knick’s Knacks. We found several items that were only available in this shop, so if you love Pixar, be sure to stop in here and check it out. Just as you exit Toy Story Midway Mania, you enter the Midway Mercantile. This is a small shop featuring all things Toy Story. If you have a child who loves Buzz, Woody and the Toy Story gang, you will find a lot of great souvenirs here. I picked the Goof up a flying Buzz Lightyear toy. Bing Bong cries candy so of course this store will be filled with lots of sweets and yummy eats. There is a preview of what to expect when this shop opens later this summer on the Disney Parks Blog. If you have a sweet tooth, this will be the shop for you. We spent a lot of time at Pixar Pier, so I feel like I learned a lot while there. For example- Poultry Palace has two great photo opps. An “Instagram worthy” wall on one side, and a “mini Zurg” on the other. Also, behind Poultry Palace is where I got the picture at the top of this post of the Incredicoaster. Second, while not technically in Pixar Pier, the Paradise Gardens Park meet and greet area used to meet Pixar characters before Pixar Pier opened is another great Instagram worthy wall… This is also the closest seating with tables for those purchasing food from Poultry Palace and Angry Dogs. I really hope at some point Disney adds a few spots with a couple tables for people to eat at. 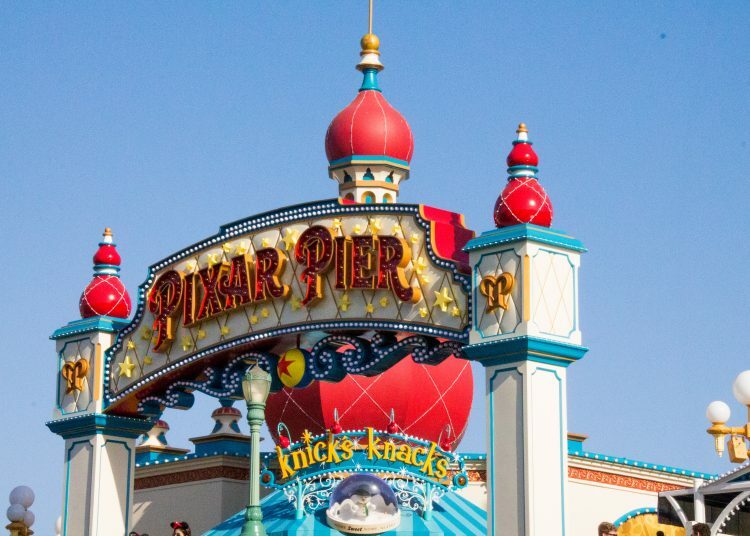 There is very little shade on Pixar Pier, so I suggest visiting the Pier in the morning or evening, avoiding the afternoon when it is extremely hot and sunny. The evenings were also quite crowded, but the atmosphere was awesome. If you want to check out Pixar Pier and the rest of Disneyland Resort, be sure to book your vacation with our friends at Get Away Today. I booked this vacation I just took through them and it was so easy to book and awesome! If you book a pacakge deal of 2 nights or more, and buy at least two park tickets, you can use code CrazyAdventure to save even more on already low priced packages! Just click the photo below to price your vacation. Click to price your vacation. We went last week. Thankfully, the Incredicoaster was our first ride because it was down the rest of the day! Radiator Srpings Racers also went down for several hours, so everyone was at Guardians! It was crazy. Thanks for sharing your tips. I was surprised by how much I enjoyed Pixar Pal-a-Round. My kids hated that we got a swinging one (a couple times it swung a lot! ), but I liked it, and the view was great!